The High Desert Food & Farm Alliance (HDFFA) here in Central Oregon has recently be granted funds to pilot a Veggie Rx program. 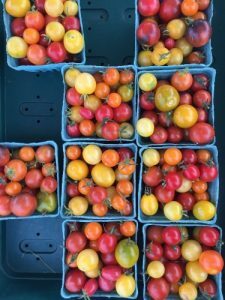 This non profit kicked off Veggie Rx full time in Spring of 2018 and is currently implementing the program at the Bend Farmer’s Market. I am excited to tell you about Veggie Rx in Bend, but do not feel I could explain it better than HDFFA themselves, so below is the program description from their website at https://hdffa.org/portfolio-posts/veggierx/. Visit the page to learn about eligibility to participate as a consumer, or as a referring provider. All six weeks of the program’s nutrition education materials are available to download as well! Veggie Rx is a pilot program designed to meet the community’s food needs by connecting clinicians, at risk members of the community, and farmers. We aim to improve the health of Central Oregonians by increasing the access to and consumption of fresh vegetables and fruits. Food security and hunger is still a present issue for many in the United States as 1 of 5 residents are food insecure (hungry) and may not know where their next meal will come from. In Central Oregon, almost 30,000 people qualify as food insecure. Food insecurity is often correlated with chronic and diet-modifiable diseases such as Cardiovascular Disease and Type II Diabetes. This project also aims to; initiate and strengthen the conversation of food security between health care providers and patients, increase access to fresh foods, reduce obstacles of nourishment, provide education, and support Central Oregon’s farmers. Implement a Veggie Rx pilot program for people experiencing food insecurity with diet-modifiable disease in order to increase fresh food consumption by participants. Provide nutrition education for participants to improve healthy eating habits by program participants. Create community linkages between health care, community resources, food system, and participants to enhance community health. Participants are recommended for the program via physician referral. Interested participants then contact HDFFA Veggie Rx Community Health Worker who will assess eligibility for Veggie Rx. Once determined eligible, and enrolled, participants will receive $20 of produce vouchers, each week, for 8 consecutive weeks. Vouchers are obtained and redeemed at the Bend Farmers Market where nutrition education takes place. Each week participants of Veggie Rx receive nutrition information and tips for eating healthy and shopping at the market. Participants work closely with a registered dietitian nutritionist to learn to purchase, prepare and cook fresh food, understand the importance of vegetables and fruit to a healthy diet, and gain access to addition nutrition education resources. Breaking down the barriers for access to, education on, and support of a healthful lifestyle is a major part of HDFFA’s mission, as well as my passion as a practicing dietitian. For this reason I support the Veggie Rx program in our community and wish it great success into the future!